I’m all for local and sustainable, but I’m also all for meat. Ethically, I love leather goods and would hate anything get needlessly disposed of, so I really eat steak to reduce waste. 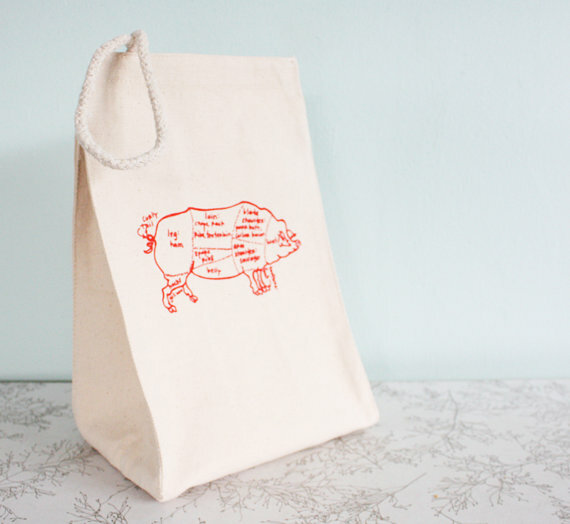 And that’s why I love this reusable, washable, canvas lunch bag: It’s got a of a butcher’s pig diagram. Give more meaning to your ham & swiss sammie while doing something good for the planet! Bitter Old Man! A guaranteed way to literally charm the pants off me is to make fantastic cocktails, and Bitters, Old Mengives everyone a leg up. 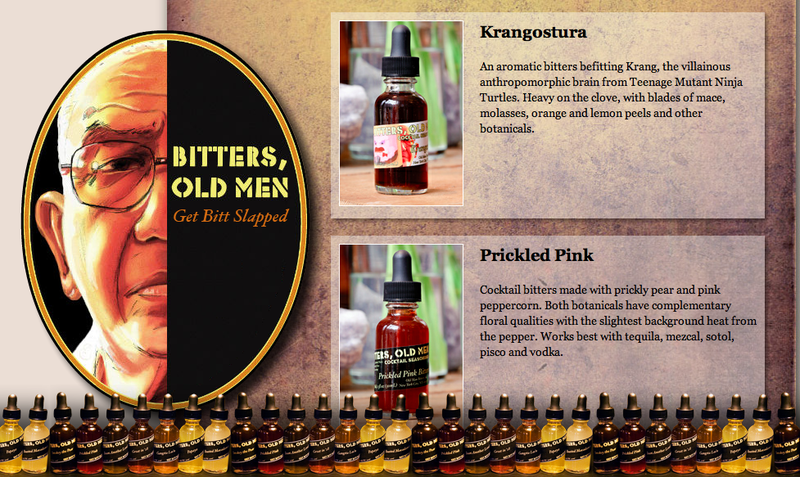 With flavors like Roasted Macadamia and recipes named things like “Gangsta Lee’n”, Bitters makes every foodie home body the booze connoisseur. I can’t wait to get my hands on some Krangostura, named for the Ninja Turtle antagonist. With hints of clove, mace, molasses, and orange and lemon peels, I’m looking forward to a bit of gin, ice, and maybe – maybe – a splash of club soda and slice of cucumber. Remember: Just a little dab ‘il do ya. Sweet, sweet sip of the close of summer. It’s Coming! (What’s coming?) Blaak! (…What?) BLAAK! Beekman 1802, aka the Fabulous Beekman Boys, are the fine purveyors of Blaak, a once yearly cheese coated in ash and aged in a cave for four months. 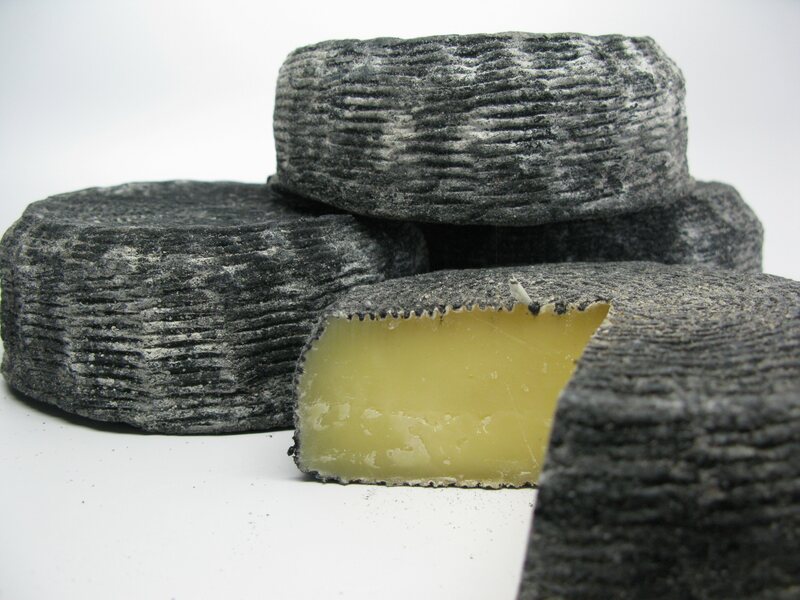 A semi-hard cheese mixed of both sheep’s and cow’s milk, Blaak’s unique, but mild flavor has earned quite the fan base. While I got on the waiting list a couple of weeks ago, it was announced yesterday that the waiting list had reached close to 1000 people, so be sure to get on it quick if you want your own hunk of tangy heaven. At $48 this cheese isn’t cheap, but it comes as an entire 2lb. wheel, so it can easily be shared amongst a couple friends. There’s a number of things on their site that I can’t wait to get my hands on, and I already know their whipped Rosemary honey will be a stocking stuffer for some of my dearest loved ones. This entry was posted in Entertainment, Food, Humor, Recipes and tagged beekman 1802, bitters, bitters old men, blaak, butcher, cocktail, diet, drinks, eat, fabulous beekman boys, geek, happy hour, kitchen, lifestyle, lunch bag, nerd, pig diagram, sustainable.